Grafts must be an integral part of analysis and preoperative planning, not an intraoperative necessity. For example, the decision to do a tip graft or a radix graft will influence the amount of dorsal reduction. One must be adept at using all types of donor material and not depend on just one type. Although septum is usually sufficient in primary cases, it is often insufficient in complex secondaries, making rib grafts essential. One should be able to harvest a graft quickly. If it is difficult to take a graft, then one will often rationalize why it is not needed. Graft shaping and recipient bed preparation are of equal importance. The less done to a graft the better. We are dubious of the long-term survival of crushed and even bruised cartilage grafts. Fixation of the graft most often requires suturing. Antibiotic coverage is important, including an intravenous dose during the operation and for 5 days postoperatively. 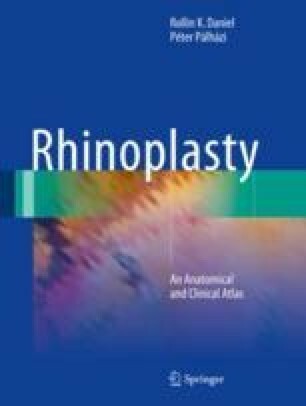 Alloplasts may be a shortcut for the surgeon, but they increase the risk of failure for the patient. Autogenous grafts rarely extrude, can withstand infection, and definitely have stood the test of time. Grafts have dramatically improved the quality of our rhinoplasty results, allowing for a more natural, functional primary result and a heretofore unobtainable nonoperative look in secondary cases.